Starting from the 1st day of this Islamic new year 1437 Hijri (14th Oct 2015), Saudi Arabia government is going to provide a new type of Identity cards for expatriates living in the kingdom named as Resident Identity Card or Muqeem Card, which is going to replace Iqama. 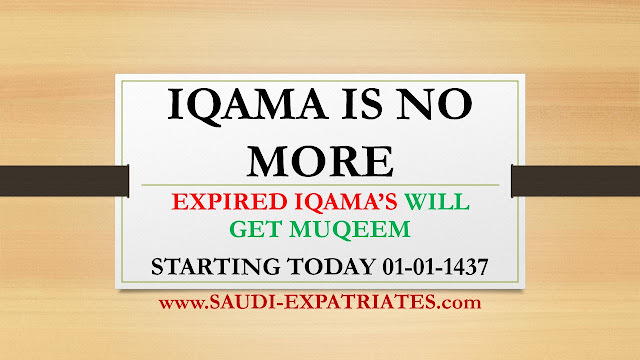 Expired Iqama's will get new Muqeem Card from this new year 1437, No more Iqama's from this year. Muqeem Resident card is already launched in Riyadh by Crown Prince Mohammed Bin Naif, Deputy Premier and MOI (Ministry Of Interior). The department will no longer use the old name "Iqama" . 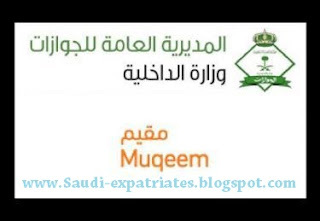 Passport department has announced that New Resident Identity Cards (Muqeem cards) to be sent by Saudi Post for individuals and companies there would be no longer need to visit any of the offices as this services will be totally online. - Muqeem card would contain Photo, Name, Date of Birth, Number, Occupation, Nationality, Work eligibility, Religion, Employer name and Work permit number. - Three years ban on expatriate, if he fails to come back on exit re entry visa after exiting from Saudi Arabia. However he can come back to Saudi, if he wants, after 3 years. - Muqeem cards are also readable at checkpoints, banks and other institution places as the special machines will install at this places to record the information. Is the fee structure same as the Old Iqama ?